Pandas love bubble baths too! Tian Tian, one of the National Zoo's giant pandas, seemed pretty excited about spring and bath time Wednesday afternoon as he splashed around in a soapy tub under the sun at National Zoo. He enthusiastically backed into the tub, rubbed the bubbly suds around his ears and shook his tail in delight. The bath was non-toxic and for Tian Tian's enrichment, the National Zoo posted on Facebook. "Rub-a-dub-dub ‪#‎TianTian‬ in a tub!" the zoo posted. "Keepers provided him a tub of water with non-toxic bubble bath soap. He really soaked it up. He rubbed it on his ears -- which is called scent-anointing. (Wait for the tail wiggle!)" 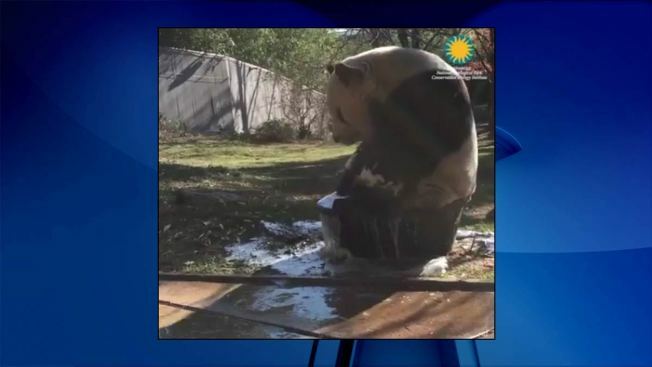 Of course, bubble baths aren't exactly accessible for pandas in the wild, but, the zoo said, "when Tian Tian is in rut -- meaning he's exhibiting behaviors associated with breeding season -- he especially likes to play in water."